A Note from Jerry About the Book, If Your Life Were a Business, Would You Invest In It? Since that time, I have worked closely with John Eckblad (the other author) and his business partner Vic Cocowitch, to adapt the methodology of their Life Business™ program into a One-Day Workshop. I have also integrated the principles throughout all of my speaking, training, and coaching. I am grateful for their insight and especially their support, and I highly recommend their book to my clients. While the book is out of print, you still can purchase it directly from the author by clicking here. Read more about the book below, or click here to read an excerpt. Through their popular Life Business™ Program workshops and seminars, John Eckblad and David Kiel have helped thousands of individuals across the United States and Europe get their lives on track using tried and true strategies borrowed from the business world. In this book, they describe their original 13-step Life Business™ principles and techniques for renewing, refocusing, reforming, and remaking any life. Their basic philosophy is simple: we can learn much about how to live happier, more fulfilling and productive lives by following the examples of successful businesses. Structured around the annual business planning cycle—the same process that successful businesses use to create, build, and maintain their futures—If Your Life Were a Business provides readers with concrete steps for achieving quantifiable life results. John Eckblad, Ph.D., is an organizational psychologist and creator of the Life Business Program, which has helped thousands of individuals, in the United States and Europe, to develop focused and vision-based life plans. David Kiel, D.PH. is an experienced organizational consultant and has taught management courses at the University of North Carolina Chapel Hill and the University of South Carolina. 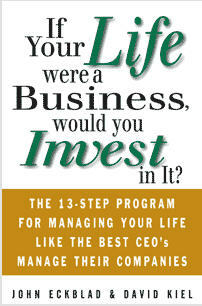 Rave Reviews for If Your Life Were a Business, Would You Invest in It?